Remo have built an outstanding reputation for producing professional quality drumming equipment that anyone can afford. 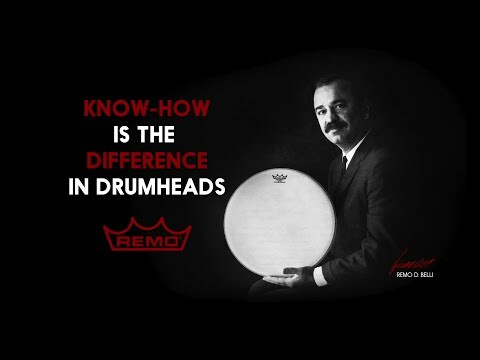 Players who favour the Remo Ambassador coated drum heads include Ahmir "Questlove" Thompson of The Roots, Neil Peart of Rush, Ronnie Vannucci of The Killers and Stewart Copeland of The Police - to name but a very select few. The Remo Ambassador coated drum heads are medium-weight heads that are made with a coated single-ply 10 mil Mylar film, which enables them to produce a warm, open, bright, and resonant sound with a warm attack. Whether you're a big hitter, a subtle stroker or an all-rounder, these Ambassador coated heads guarantee a beautiful response to your touch every time. For both live and recording situations the Reme Ambassador coated head are perfect, as their fantastic reliability means that you can rest assured that you can expect to reproduce the same sounds with absolute accuracy and minimum effort. Remo drum heads are renowned for their incredible resilience, and the Ambassador coated skins are no different. Night after night, session after session, these beauties can take pounding after relentless pounding and you'll be amazed by their ability to endure. If you're looking for a 14" snare/tom skin that responds beautifully and produces a highly articulate sound, then the Remo Ambassaddor coated drum head is a must have.